Our water is normally fluoridated and fluoride is contained within many toothpastes. There has been much discussion recently about the dangers of fluoride. "fluoride is not an essential nutrient. No disease, not even tooth decay, is caused by a 'fluoride deficiency. '(NRC 1993; Institute of Medicine 1997, NRC 2006). Not a single biological process has been shown to require fluoride. On the contrary there is extensive evidence that fluoride can interfere with many important biological processes. Fluoride interferes with numerous enzymes (Waldbott 1978). In combination with aluminum, fluoride interferes with G-proteins (Bigay 1985, 1987). Such interactions give aluminum-fluoride complexes the potential to interfere with signals from growth factors, hormones and neurotransmitters (Strunecka & Patocka 1999; Li 2003). More and more studies indicate that fluoride can interfere with biochemistry in fundamental ways (Barbier 2010)." Comes in fennel, mint, minty cool, or citrus and aloe vera flavours and is fluoride and SLS-free, and free from artificial sweeteners. Formulated with organic essential oils, Vitamin C and Myrrh, they offer natural protection against bacterial growth, one of the main causes of gum disease. 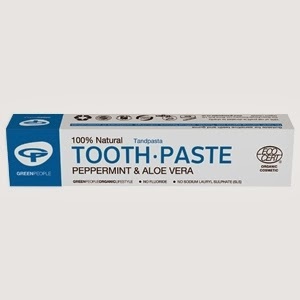 Green People's natural toothpastes contain soothing ingredients that are gentle on sensitive gums. Come in two flavours: mandarin and aloe vera or mint and aloe vera. These certified organic toothpaste for children are gentle enough to be used on babies' gums even before their first tooth emerges to reduce the discomfort of teething. When you are used to using a foaming toothpaste which leaves your teeth feeling tinglingly clean, this toothpaste is quite hard to get used to because it is very sticky and doesn't lather up in your mouth like regular toothpaste. I used mint flavour but also couldn't really taste the mint. My 22 month old loves the fruity kids paste though, and it has really helped to get her to brush her teeth which she didn't before, and with no worries about her swallowing something poisonous. It seems to work well too. After a week my teeth still felt clean. Greenpeople products are also 100% cruelty free and not tested on animals, and most pastes are fully vegan like me. Peppermint & Menthol - natural flavour. This paste lathers up like a normal toothpaste, and has a pleasant taste. It is a clear gel and I tend to use quite a lot to clean my whole mouth. I notice that sometimes my teeth don't feel as 'clean' as they used to with regular toothpaste, maybe a little furry? 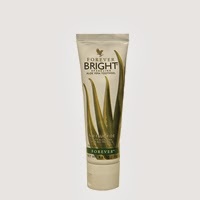 This is a non-fluoride formula, that contains aloe vera and bee propolis. 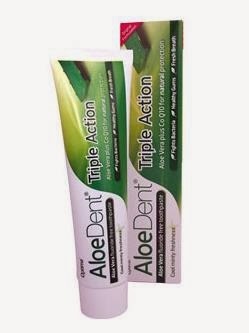 It is designed to nourish, strengthen and protect teeth and gums whilst fighting plaque and whitening without bleaching agents. It has a mint flavour. This mouthwash combines the soothing properties of Organic Aloe Vera with Icelandic moss, Tea tree and Grapefruit and Gotu Kola with a mint flavour for fresh breath. This mouthwash has a very strong taste but it does the job without fluoride, alcohol and other nasty chemicals. Mouth care includes brushing the teeth, flossing between them, and checking the inside of the mouth and gums. Healthy teeth and gums make it easy for you to eat well and enjoy good food. Best way of mouth care is that brush your teeth twice a day with a soft toothbrush and fluoride-containing toothpaste.